All the Colors of the Dark seems, on the surface, pretty standard fare for giallo. Once you scratch the surface though, you quickly discover a film that’s at once familiar but distressingly not at the same time. All the Colors of the Dark finds Jane (played by genre standard Edwige Fenech) plagued by visions of her own death after suffering the loss of her child in a car accident. Her mother (also played by Fenech in a flash-back to up that dream state/”what the hell is going on? Is this real” feel) was savagely attacked and killed when Jane was a child which still haunts her and is presented as a source of anxiety and ongoing issues in her life. Her boyfriend Richard is a pharmaceutical salesman and believes she just needs to take her vitamins and that will fix her up. When this holistic approach fails, Jane turns to her neighbour Mary who suggests a much more spiritual resolution – a Black Mass. In what is probably a learning moment for anyone interested in taking part in weird psycho-sexual evil orgies led by Eye of Horus wearing hippie weirdos, the Black Mass only seems to awaken something darker in Jane, manifesting the visions of her own death into reality via a blue-eyed stalker that haunts her. It’s how these fairly standard building blocks are assembled into something familiar yet very much not that really make this movie one that fans of giallo and bizarre ‘70s cinema in general one to seek out. All the Colors of the Dark rushes headlong into the bizarre and psychedelic right from the start, a move that sets the tone for the audience lets you know that this movie, a member of a genre already known for being weird as hell, is stranger than anything that’s come before. It still stays within the confines of the genre (detectives, red herrings and bottles of J&B abound!) and isn’t without the occasional dip in suspense, but compared to many of its contemporaries All the Colors of the Dark hums along at a breakneck pace. Not content to take the standard black-gloved killer kills using weird implementations of death, All the Colors of the Dark thrusts the viewer straight into a psychedelic landscape from the moment it starts with a kaleidoscopic kill scene that feels every bit drenched in LSD as faces shift, knives explode into fractals as they move in for the kill over and over (and over) again, preventing the viewer from ever getting stable footing during these sequences. The psychedelia isn’t ever-present and we settle into a standard (see: less Jodorowsky-esque) narrative structure, the opening sequence introduces the dream-like nature that makes this movie such a unique trip, immediately letting the viewer know that anything they are presented with cannot be trusted to be real. That distrust of reality and our own eyes is the core of the movie and one of its most powerful tools – throughout the film we are left to question if anything we see is actually as it’s presented or if it’s all been altered at some point along the way through the mind of a highly unreliable narrator. Not content to let the audience escape without one more reality skewing moment, the conclusion of the story takes a detour from the typical giallo “here’s the killer, you solved the mystery” resolution that should leave the audience satisfied. Instead we’re left holding something wholly darker and more nihilistic than any other movie I’ve watched from this time period and genre. Every inch of the film is saturated with the typical ultra-sexuality and style you expect from the era – scantily clad beautiful women in beautiful settings being murdered (for lack of a better word and for alliterations sake) beautifully. The violence and gore is ramped up in comparison to some of the less salacious entries in this genre, which lends it a grindhouse feel that 2019 audiences are definitely going to be into while not devolving completely into a exploitative bloodbath. 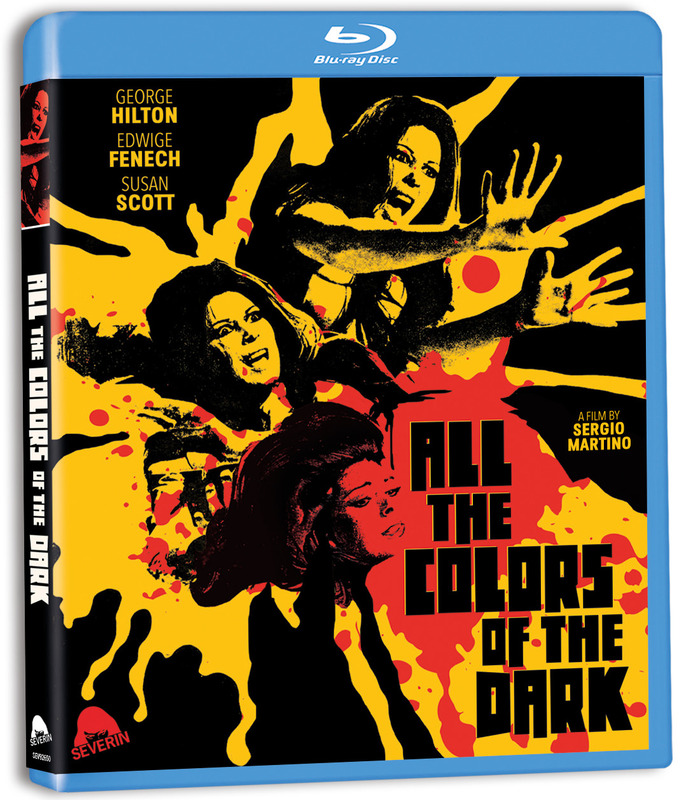 Severin Films have done a fantastic job restoring this film with a 4K release that includes an alternate North American cut of the film, a commentary track featuring Kat Ellinger, Author of All The Colors of Sergio Martino, interviews with director Sergio Martino as well as screenwriter Ernesto Gastaldi. There’s a ton to dive into here and learn from, so props to Severin Films for going to extra mile and putting together a package more than worthy of the modern collector market. You’re going to want to own this if you’re interested in the genre as there really isn’t another movie like this one and we’re not going to see a release with more attention and respect paid to the film than this for a long time.